I’m a little amazed by how well this training cycle is going. I know I’m only four weeks in, but four weeks into the last one, I was burnt out and slowing down. I hit the gym on Tuesday, as usual, for my easy three and strides. This week my easy runs are being done with intervals of 8 minutes running and 2 minutes walking. I was kind of apprehensive about this, especially because Amanda has been doing the same intervals I’ve been doing for the same mileage but a week earlier, and she said that the jump from the 5:1.5 ratio to the 8:2 ratio was really tough. But I knew I had made it through my 10:2 tempo run last week, so I was hopeful that this wouldn’t be too awful. And it wasn’t. In fact, it was–dare I say–easy. I usually do my treadmill easy runs on 4.8 for the running intervals, but I was mixing it up all over the place on these intervals, running anywhere from 4.8 up to 5.2 (which doesn’t sound like a huge difference, until you realize that’s over a minute per mile faster). I started playing games with myself to ease the treadmill boredom. I would count to 100 in my head and then I could either speed up 0.1, slow down 0.1, or stay the same speed before restarting my count. I almost always chose to speed up. If I looked at the time display before I was to 100, I had to automatically speed up with no choice. So I took some time to edit the TCX file by just copying over my third interval to my fourth, even though I knew I had run my fourth faster. But I just wanted a rough estimate of how much I had ran. It showed that I had done 3 miles after my fourth interval, so with the extra bit I did afterwards, I was up to 3.3. Okay. 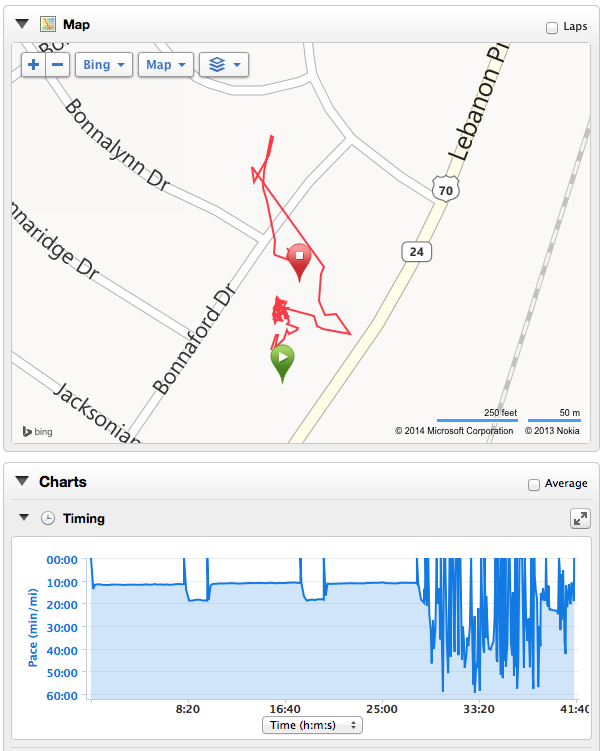 My strides also went well (and I turned the GPS off for them so they were reported accurately). This week I did five at 7.0 and three at 7.5. Woohoo! I was a little stiff going into Thursday’s run, so I made sure to foam roll my IT band, quads, and glutes before I headed off to that magical land of sweat and loud machines. I was nervous for this week’s tempo run. (20 straight minutes at an 11 min/mi pace? I haven’t done that in four months!) But I got on the treadmill with the mindset that I was going to do it. No matter what. I was going to do it. And I did. Footpod said I was a little faster than the treadmill did. The treadmill average was 5.4 mph, which is equivalent to 11:06 min/mi. The footpod average was around 10:30 min/mi. Once I can get out to an actual track, I’m going to do some tests on that thing, but Google tells me it’s possible the footpod is more accurate than the treadmill, even uncalibrated–especially if the treadmill is older (which it is). I don’t know. I just make sure that the pace I need to do is met by the treadmill, and if it happens to actually be faster, then cool. All I know is that if I judged by effort, I would lean towards the footpod being more accurate. A 17 min/mi walk doesn’t feel like a speed walk to me outdoors; it does on the treadmill. Just about every pace where I know what it feels like outside feels about 1 min/mi faster on the treadmill. Saturday, I woke up to a winter wonderland. (Well, as winter wonderland-esque as it gets in Nashville.) I was supposed to run with Amanda again, but she came down with the flu. So I headed out to the park, but sadly all the snow had already melted by the time I got out. It was around 38 degrees, but warmed up to around 47 before I was done with my five miles. I had no problems, other than getting mildly warm after the sun decided to come out. The next day I was scheduled for nine miles. I had some issues motivating myself to get out the door, but once I did, it felt okay. Nine miles seems to be my problem area. I’ve only had two actual runs longer than this distance, but the 8-9 mile mark is always where I start to drag. You’ll remember it was around this point in the Disney half where I really started walking more than I was running. Because of this, I have a good focus on this distance in my training plan. I basically stay around this mileage on my long runs for a month before going up to 11 miles. Today, I finished my 8:2 intervals without any extra walking and probably faster than I should have (most of my running intervals were around 11:30 min/mi, when they should be staying between 12 and 12:30). I definitely felt absolutely exhausted by the time I was done. It didn’t help that for more than half the run, I could feel a clipped fingernail that had somehow gotten caught in my sock; I stopped around mile 5 to pull it out. I also had some kind of awful blister/callous on my right pinkie toe that I could feel the whole time. And apparently I developed a really ugly blister on my left foot as well. I don’t know if I need to reevaluate my long run shoes or what. I currently am wearing my Pearl Izumi Road N2s, which have pretty much been my exclusive long run shoe through both half training cycles, and what I ran the Disney half in. Although, if you remember, I wanted to burn those shoes after the half. Maybe I should experiment with some of my other shoes on long runs, though none of them really fit the long run bill. My Skechers are close to being worn out, so I’m using them mainly for speed work. My Kinvaras are much too narrow for long runs; they would definitely give me blisters on anything longer than 5 miles, though they are my preferred shoe at the moment. The only other option I have are my New Balance trail shoes, which don’t just scream long run comfort to me. I’ve been toying with buying another pair of Skechers, or maybe trying out some Mizunos. But this week at the 15k, I’ll probably be sticking with the Pearl Izumis because you don’t try new things on race days! This entry was posted in Weekly Update and tagged shoes, tempo run. Bookmark the permalink.